A great evening of music making, with music to cater for all tastes. Music that was played with sensitivity and skill in equal measure. That summed up the evening enjoyed by Sittingbourne Corps which had been arranged as a way of raising funds for the Big Collection. 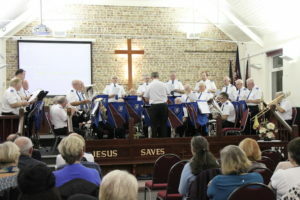 Prior to the concert the Band were fed and watered by the Corps folk in readiness for the 7.00pm start. Up first was one of my favourite Marches-Celebration-by Major Leslie Condon. For a March that is now 40 years old it rightfully stands as No.1 in the list of all time SA Band Marches. It was played with skill and dexterity. A great start. 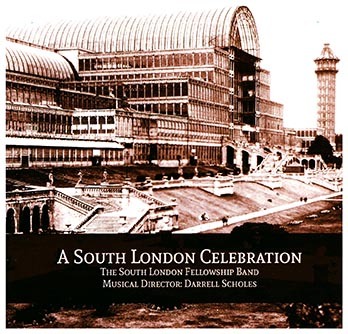 Next up was a Kenneth Downie Arrangement-All for Thee- simple in its composition but an arrangement I’d not heard before. Our Corps Band may take a look at this soon! 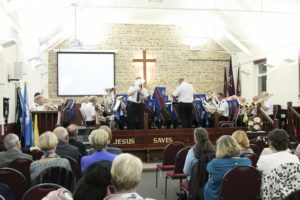 After a prayer and congregational song-I’ll Stand for Christ Alone-the Bandmaster Darrell Scholes introduced the Suite-Crystal Tide- by Bandmaster James Wright. It featured the old Gospel Songs, Down where the Living Waters Flow, Shall we Gather at the River and Way over Jordan. New technology greatly aides worship in many ways and the visual presentation provided by Major Graham Kinsley showed the words associated with many of the pieces during the evening. This is such an effective way of bringing music to life and understanding what the composer is trying to say. It takes a lot of work (and know how) and was a great addition to the worship of the Band. 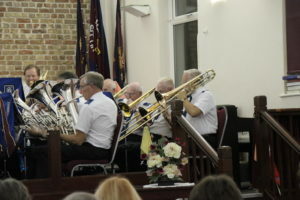 The next two items were the evenings featured soloists-Adrian Horwood on Euphonium playing Canaan’s Land and John Rogers on Eb Bass playing a little know Mozart Aria. As a long-standing Euphonium player that is now playing Eb Bass both these items held my full attention. Adrian for his technical ability and particularly lovely playing of the middle movement-A little star peeps o’er the Hill, and John who produced a wonderful full Bass sound on a sparsely used Solo instrument. The first of two male voice items-Gods Love to me is Wonderful-with Brass Accompaniment and arranged by Dirk Krommenhoek is a foot tapping arrangement. The Bandmaster sat down next to me and I hope he wasn’t put off by me singing along! Alone Yet Not Alone was premiered by the Band. An arrangement that had very much a Celtic Feel to it and which I am sure will be used by more Bands in the future. Special praise to the 1st Baritone (John Clarke) who starts the piece on his own. A Pilgrim Song is a cleverly written variation associated with the words-He who would valiant be gainst all disaster. Arranged by Thomas Rive is has interest for the whole Band where different sections are featured. Another piece that bought back memories to me of playing this. Following a well-deserved interval with an Army Cup of Tea, the Band started the second half with Kevin Larsson’s-On we March. To the discerning Brass band enthusiast, he has a particular writing style with a particular love of triplets. 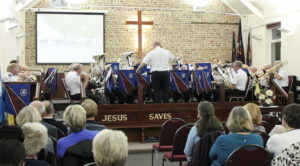 His music is always exciting and was well played by the Band.After a congregational song, In Christ Alone, the Band went back in the journals to play Norman Bearcroft’s Songs of Testimony. No doubt many of the Bandsmen had played this many a time, but the message is timeless- “You can tell out the sweet story. You, Yes You!” Once again the music was well played. The trombones featured in a Classical arrangement of Panis Angelicus and I mentioned that it was nice to hear 5 Trombones and how at Sittingbourne we’d happily take them on a transfer! The next items had a degree of poignancy to the Band. This was their first engagement following the sudden passing away of Simon Birkett a few months earlier. 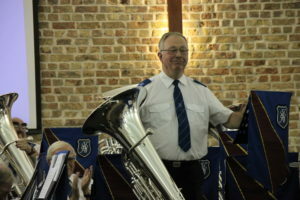 Simon had played Euphonium with the Band and it was a shock to all that at 47 a father, son, husband and great musician had gone to be with his Maker. One of Simon’s favourite pieces was the beautiful arrangement Lavenham. The story on how it was written and its enduring legacy to the Corps at Lavenham was talked about. This is such a lovely arrangement to listen to as well as play and was complemented by the extremely challenging words. The silence at its conclusion said it all. In the same vein the Band sang When Jesus looked O’erGalilee which finishes with the triumphant line- “The Lord shall live again”. The final foot-tapping item to round off the evening was the lively festival march Light-bringer bu Martin Cordner. While giving the thanks I mentioned that there must be around 5000 Salvation Army Brass Band publications just produced in our Territory so It can be difficult to choose and construct programmes to please the listener. 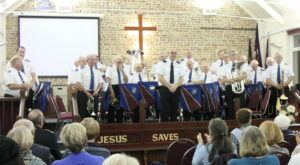 The Bandmaster and Band got it spot on and everybody whom I spoke to said what a wonderful evening it was. That’s a credit to the Band and the Bandmaster. The sum of £449.35p was raised during the evening towards the Army’s work in the UK. We give thanks for the generous giving and what was a fantastic Saturday Night provided by the South London Fellowship Band.